Generally, \"movie\" video games fare rather poorly, as has been the case for years, but with some recent standouts, especially in the comic-to- movie-to- game adaptation category, there\'s a growing precedent for quality. So does Fantastic Four break the mold, or fall victim to yet another rushjob? Grab your spandex and jump on in for your answer. It seems at least once or twice a year we get a new wrestling game, which is great for fans, but what does WWE Wrestlemania 21 have over the countless other wrestling games? Find out if it has what it takes to pin the competition, or if it gets hurled from the top turnbuckle. Microsoft is back with the sequel to the old hotness, Dungeon Siege II. Is it all that Diablo and a bag of chips? Blaine seems to like it OK. We locked him in a room and didn\'t let him come out until he beat Elite mode. Read on for the results. Conker was pretty much mindblowing when it came out for the N64. Of course, that was back in the day when GTA looked a lot like playing with Matchbox cars. Now that the gratuituous naughty humor is a bit more common in gaming, how does everyone\'s favorite raunchy squirrel hold up? Check Laurie\'s review for more. Dragonball Z: Sagas is out now for the big three consoles, and, well, it\'s another Dragonball game. Unfortunately, we\'ve seen power levels much higher than this in the past, and, well, Blaine will break the news to you as gently as possible in his review. 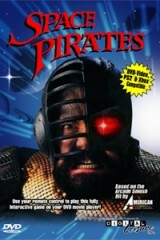 Space Pirates is another of the video-based videogames released by American Lasergames for systems like 3DO, Phillips CD-I, and Sega CD. Digital Leisure has been reissuing these games formatted for any DVD-capable system, including PC, Mac, DVD players, Xbox, and PS2. Designed to play with a light gun or a DVD remote, this title attempts to make anything with a DVD into a game system. Check out the review to see if this is one to put on your must-play list this summer.